At my main computer workstation, I use a standard, armless task chair with a pneumatic center support post. It's comfortable, rolls effortlessly, and supports a reasonably healthy posture, but for more relaxed computing - say a casual Web-surfing session or viewing photos onscreen - more relaxed seating has considerable appeal. There are plenty of computer chairs of the market, but being of a frugal, do-it-yourselfer bent, the potential for making one myself intrigued - at least theoretically. The catalyst that moved this project beyond theoretical daydreaming came in the form of a passenger front seat unit from my brother-in-law's 1987 Chrysler New Yorker that ended up in our storage shed for a few years after the car was cut up and disposed of. 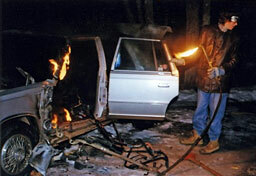 Here are a couple of shots of the undignified end of that once proud automobile some years ago. Anyway, my wife was on a drive to clean out junk and haul it to the dump, and the New Yorker seat got deposited on the discard pile. 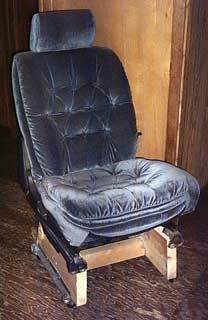 "Wait a minute," said I, "that seat's in really good shape, and it looks comfy." 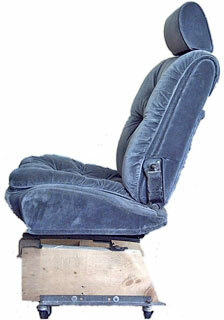 I rescued the seat from the trash heap - not a completely popular decision. The car seat was, of course, way too low to be used as a computer chair, so I set about devising and constructing a simple base to update it to the proper height, and I thought it would be convenient if the chair would roll as well. Happily, I found a set of heavy-duty roller casters that may have been intended for a furniture dolly that a friend (who had moved away) had left in our garage. For the pedestal base, I settled on some 2" x 10" spruce lumber that I had left over from a home renovation project for the main risers and a piece of standard 2" x 4" spruce for a crossbrace. Spruce isn't the prettiest wood, but it's strong and holds fasteners well, even screws going into end-grain, as would be the case in this instance with my 2" x 4" brace. The Chrysler seat was designed to bolt onto stamped metal mounts on the car's inner floorpan, and happily I found they would work just fine with 1/4" leg screws going into the top edges of my 2" x 10" risers, which I cut in a simple shape square at one hand and trapezoidal at the other, in order to lengthen the the support base a bit. The actual support base would be determined by the distance between the roller casters on their metal mounting bracket - and if I had my preference, they would be further apart, but in practical use the chair has proved stable enough. 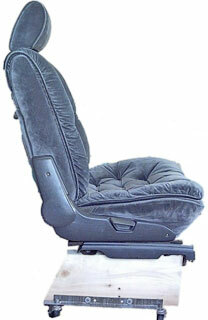 One can adjust fore and aft weight distribution using the car seat adjuster mechanism, which remains integral and functional. Calculating the chair height took a bit of cut-and-try. At my computer table, I prefer a seat bottom cushion height of about 20-21 inches from the floor at the front edge of the cushion. I first tested it with the top edges of the 2" x 10" base aligned flat and parallel with the floor, but that tilted the bottom seat cushion too far forward, so I ended up cutting an elongated "pie-slice" off the top edges developing from zero at the front edge to 1-3/4" lower at the trailing edge, which provided what I consider to be of the right amount of rake. The Chrysler seat's backrest adjusts and reclines, which is convenient and helps one arrive at exactly the most comfortable angle. This seat is indeed a pleasant place to perch, which was no big surprise, as it was comfortable when it was in the New Yorker. 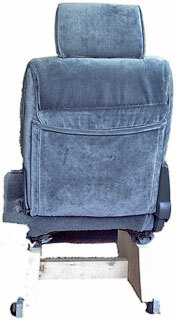 There is even a handy net pocket in the seatback and another under the front for stowing stuff off the floor. I think it looks just fine too - a bit funky perhaps for home furniture, being asymmetrical in profile, but the button-tufted rich velour fabric of this seat suits my senses of aesthetics and tactile feel (not my wife's, alas, although I can't help but notice that she doesn't seem to mind sitting in it). The wooden base could be more elegant-looking, preferably painted gray or black, or even with a varnish coating, but I haven't gotten around to that. The caster roller set I used is definitely "industrial-looking", but using more attractive casters, possibly purpose-sourced rather than scrounged, would of course be possible with a project like this. However, part of the satisfaction for me is using odds and sods that I have on hand to make something useful. In general, I'm quite pleased with how this chair has turned out, and indeed I find it the most comfortable seat in the house - one that I gravitate to whether I'm using a computer or not. It's very satisfactory for relaxed computing too, although it's a bit too soft and laid-back for workstation duty. 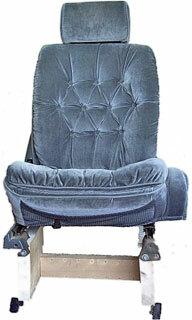 I'm planning to enter it in the Car & Driver magazine "10 Best Car Parts for Interior Home Decor" contest.